Nelson goes for a double-whammy. At the same time as this scam, he is trying to hook me under another name. Little does he know I'm onto his game! First I must solicit your confidence in this transaction, this is by virtue of its nature as being utterly confidential and top secret. Though I know that a transaction of this magnitude will make any one apprehensive and worried,this transaction by is very nature is in deed one of a rather complex nature and it has as its bane the issue of TRUST but I am assuring you that all will be well at the end of the day. There is no doubt that trust conceptually is a conundrum which leads its self to deferring interpretation, it is not to the extent of empirical of scientific proof We have decided to contact you due to the urgency of this transaction, as we have been reliably informed of your discreetness and ability in transaction of this nature. Confidential Transaction, which involves the transfer of Huge sum of Money to a Foreign Account requiring Maximum Confidence. A Foreigner Late Engr. Steve Moore (Snr.) an Oil Merchant with the Federal Government of Nigeria, until his death months ago in Kenya Air Bus (A310-300) Flight KQ431, Banked with us at ZENNITH INTERNATIONAL BANK, Lagos and had a closing balance as at the end of September, 2000 worth US$35,500,000.00 (thirty five Million five hundred thousand United State Dollars), the bank now expects a next of kin as beneficiary. Valuable efforts are being made by the ZENNITH INTERNATIONAL BANK to get in touch with any of the Moore's family or relatives but to no success. It is because of the perceived possibility of not being able to locate any of Late Engr. Steve Moore (Snr.)' s next kin (He had no wife or children that is known to us). The Management under the influence of our Chairman and Members of the Board of Directors, has made arrangement for the funds to be declared "Unclaimed" and subsequently be donated to the trust fund for arms and ammunition to further enhance the course of War in Africa and the World in General. In order to avert this negative development some of my trusted colleagues and I now seek your permission to have you stand as next of kin to Late Engr. Steve Moore (Snr.) so that the fund US$35.5 Million will be released and paid into your account as the beneficiary's next of kin. All documents and proves to enable you get his fund will be carefully worked out. We have secure from the probate an order of madamus to locate any of deceased beneficiaries, and more so we are assuring you that this business is 100% Risk Free involvement. Your share stays while the rest be for myself and my colleagues for investment purpose. According to agreement within both parties. As soon as we receive an acknowledgement of receipt of this message in acceptance of our mutual business proposal, the necessary modalities and disbursement ratio to suite both parties are thus: 30% for you a/c owner,10% for the expeneses, 60% for i and my colleagues. While replying furnish me with your private fax and phone numbers for easy communication AND YOUR BANK PARTICULARS. Whilst this anormalities may well exacerbate your doubt and apprehensive about the transaction in view of the fact that you area person not physically known to us. I must have to advice you that a healthy degree of caution be exercised before conclusions are reached by your goodself. If this proposal is acceptable by you, do not make undue advantage of the trust we have bestowed in you. Many thanks for your email, it is very much welcomed. I hope that your situation gets better very soon. I would very much like to help you in your plight, but first I have some requests of my own. First, some information about myself: My Name is D'arth, and I am the owner of The Dark Side Industries. My company has 1,239 employees in 11 different factories. 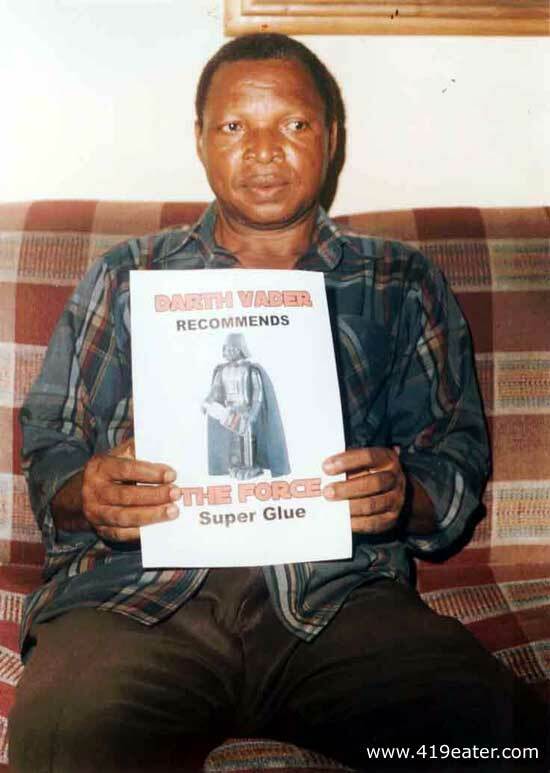 My company manufacture many type of glue, including the famous "THE FORCE" triple bonding super glue, which is by far our biggest seller. We sell approximately 8.5 million units per year all over the world. My company's annual profits are in the region of $11.3 million Dollars a year. We welcome investors in our company, and we also invest in other companies or people who have something to offer us in the way of skill or ideas. Now back to your proposition. It sounds very interesting and extremely tempting, but I am afraid that I am going to have to make a request of you before I am willing to proceed any further. destroy the image for security and confidentiality reasons. If you are willing to go to the trouble of having the photograph of yourself holding this image done for me, this will convince me that you are serious about your proposition, and you can be assured 100% of my support and total trust. Thanks for your mail and how are you today. I do understand that such transaction like this will make you think so many things in your mind. I do want to let you know that this transaction is 100% risk free as far as you can be of help to me on regards of this fund. Mr. D'arth, like you can see on the mail i sent to you, Am ready to make things works out fine between both of us. After this transaction i will be investing my own part of fund in your country, as i can see you are really a business man that will be of help to me, by investing my part of fund in your country. This is not what we have to be talking on mail much,but i do want to tell you that you can 100% trust me on this transaction. please do give me a call so that we can talk at let 234-803-349-0326 this my number or you can send your personal phone number, i will call you. Your request is quit welcome, and i do want to hear from you first on phone. call me now.Thanks for your co-operation. Thank you for your reply, and you will find my personal contact number below. I am happy to accept your call, but please do not think that I will enter into any partnership without you fulfilling my requirement for the picture. Here is my private personal telephone number +44 7092 037387 if you wish to speak with me. I am a busy businessman, so if I am not at home to speak with you please leave me a message and I will call you back. If you are leaving a message, please repeat a password three times, slowly. You need to speak a password because I get a lot of nonsense calls, and I do not return calls if a password phrase is not given. The password will identify you as a trusted caller. The contents of your mail of 19/09/03, was duly digested yesterday, 21/09/03, & clearly noted. I strongly believe that knowing you is designed by the divine intervention of God. I must confess, that I'm privileged & highly favoured by my God, for introducing me through this business assistance relationship to a Royalty, a successful businessman, with the grace of God upon him to managed such a great company/empire with large crowd of workers. As a matter of fact, I'm very pleased to work with you, knowing quite well that I'm in the right channel, for the security of our funds, & investment advancement. succeed. My dear friend, should you prove to me beyond doubt, your fairness/truth over your proposal/request that is only to satisfy your conscience. As soon as, I hear from you, confidentially, that you mean no harm, than to co-operate for our mutual benefit. I'll immediately attach the photograph to your mail box as large you want it. Frankly, I'll advise, you should relax and fill free to work with me. I'll be expecting your urgent feedback to enable us progress. Thank you for your email, and the contents are fully understood. As a reputable businessman, I can assure you 100% of my confidentiality and honestly. I look forward to receiving the image I require, and I hope to do business with you soon. THANK YOU FOR YOUR MAIL. I'LL EVENTUALLY SEND THE PHOTOGRAPH ON THURSDAY BEFORE THE CLOSE OF OFFICE HOURS. I CANNOT NOT MEET UP WITH THE SCHEDULED TIME AS AGREED WITH MY PHOTOGRAPHER TODAY, BUT FIRST THING ON THURDAY CONCLUDE WITH HIM & THE SCANNED PICTUE WILL BE MAILED TO YOU. I'm very sorry, I cannot send the scanned picture to you today as required, due to workload in my office. But before I resume office tomorrow it will be in your mailbox. Pls, try and see reasons with me. I will contact you as soon as the picture is received. As a matter of fact, I've to comply/bend to your request based on the seriousness /attention given to this transaction by your humble self. As earlier mentioned in my previous mail, this transaction is my life time hope & I'm ready & willing to do anything possible for the success of this friutful opportunity. My photograph, carring your advertising Image with me is attached, as requested for your appraisal. I hope you are satisfied with the picture? It is time we progress, As we all know that "The taste of the pudding is the eating" Zennith bank is always ready for his customers. So you should try to send your mailing address, phone & fax and your banking particulars for the pre-transfer documentations of the fund to your designated bank account. As soon as I receieve the requirements from you, I'll immediately submit the particulars to the remittance department for their communication & processing of the payment through our Apex bank for payment. The bank will be contacting you directly as the next of kin for the transfer of the fund. Please, it is very important you know that this transaction/opportunity is highly privileged & confidential between us and as such must be guided with trust & secrecy for our mutual benefit & for the complete success of the business. whatever, informations received from the bank must be mailed to me to enable me guide you on what to do & how to go about it. Meanhile,do not in anyway let any of the bankers know our relationship. Please, call me for a clearer explanation on this number: 234-803-323-7023. Thank you for your email, and the picture you sent to me. Let me explain why I wanted the picture: First, it is to prove that the picture was not a forgery. If you sent a picture without my image, of course this could be anyone else, so it would not prove it was you. Having you pose for the picture holding my image would of course be more difficult to forge, and no one else would have my image. I have two problems Mr. Coakley. My first problem is this: My advertising image is so small that I cannot see it clearly. You will have to take the picture again and make sure the image is CLEAR and LARGE. My second problem is this: WHY have you sent me a forgery? WHY have you put some other persons head on your body? Do you take me for a fool sir? As you have said, it is time we progress, but your dishonesty is preventing this. Pls, I'll send you a comprehensive mail tomorrow inrespect of you mail. My dear friend, Mr. Vader, I must confess, that I'm highly disapointed with your language qoate "Why have you sent me a forgery? Why have you put other person's face to your body? Do you take me for a fool Sir"
It is very improper & unrelialistic of you to think or reason that I'm faking my person. Is it because I'd to ahead to your selfish request. Mr dear friend working with you does not mean that I don't have a gut/pride of my own. If you think that I'm wrong or forgery, then let's fix a date for meet face to face for a meeting. Please, try & understand, I can never sell my birth right, under any circumstances. so far, I've obeyed you sheepishly. Now if you want this deal in truth, let's have a telephone dialogue via: 234-803-323-7-23 to straight out things over the pending matter. Once more, my dear friend, Mr. Vader, I hate to be humiliated or treated with reckless abandon. This is a FACT sir. The head which is on the body you sent to me is FALSE. That is a 100% truth. Look at the enlargement of the image I have attached. You can plainly see all the jagged edges where the image has been BADLY manipulated. Also, the lighting on the face is DIFFERENT from the body! Even a child can see that this is a very BAD forgery. I will not bother to communicate with you again sir, UNTIL you send me a TRUE image of you holding my sign. No negotiation. 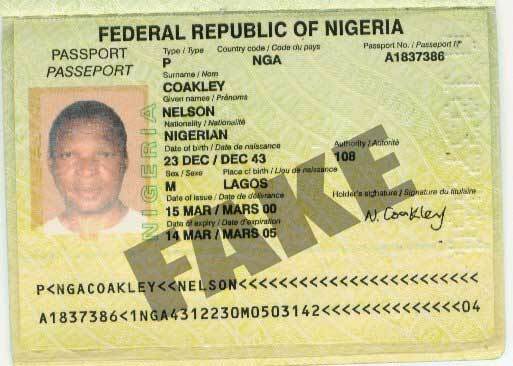 It is YOU that are ridiculing me by attempting to fool me with that ridiculous forgery. Nelson Coakley Voicemail. Received 11/10/03. Click HERE to listen (35k/21 seconds). How are you today? Hope yopu are very fine. you just decieded not to write, i called you line and left message with your answering machin but you did not get back to me. My good friend, i want you to help me on this transaction, why acting like this, i can't just loose such huge amount of money. Tell me what you still want me to do. This fund am talking about will be frozen if we do not work toward this fund. both of us can be of good help to each other. okey i want you to send me your picture too. And lets work things out. please do not send any mail to any person tring to impersonate me expect this maill address. we cannot afford to loose this fund. Am hopine to hear from you. Ii is not I who decided not to write, it is you that has decided not to send me a you image holding my picture. It is your doing that the fund will be frozen. You are the one who sent me a fake image. I have already explained to you that I will absolutely NOT go any further with this deal until you send me the image I require. I await your image. Until that is received please do not waste my time with further excuses. I hope this correspondence meets you in good health. I am sorry for not getting back to you all these while, it was as a result of my ill health. After the last mix-up in the photographs of my secretary sent to you, I had to wait for my health condition to improve so that I can take the shots personally to send to you. Consequently, find attached to this mail is the scanned copy of the photography that you require. I believe with this you will be concerned that I am being open and sincere to you in this laudable transaction. Please furnish me with the required information so that we can begin this laudable transaction in earnest. Alternatively you can call me on my new Tel/fax number; 234-1- 776-0541 for us to discuss the modalities of bringing this laudable transaction to fruition. While I expect your prompt and positive, my warm regards to you and your family. NB: Please disregard my earlier Telephone number : 234-1-776-7844 which was earlier given to you as it has been allocated to another official. Thank you for sending me your latest photograph. It seems that it is a genuine photograph, however, before we proceed with your proposition I have a couple of questions. 1. If the FIRST image you sent to me was not a photograph of you, who was it? 2. Please would you forward me a scan of your international passport? As a gesture of good faith and courtesy I have attached my own international passport. Once I receive a copy of your passport I will be happy to proceed with your proposition. I am sorry for not responding on time to your mail, it is due to the fact that I am currently on a private family visit to the country side where internet service is rearly available. However I shall be returning back to my station on Wednesday and I hope to send you a scan copy of my international passport before next weekend. While I expect to be in touch with you later and also wishing you a happy weekend, my warm regards to you and your family. Thank you for your explanation which is accepted. I look forward to your next communication. This is to inform you that I have returned back to my station from my visit to the country side. 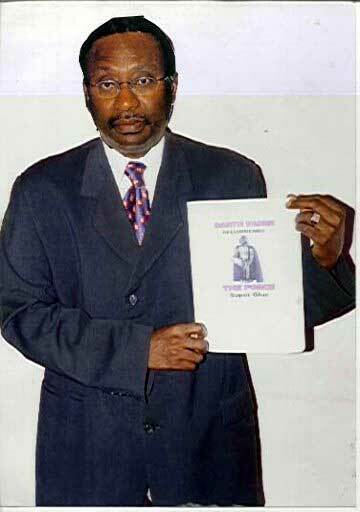 By tomorrow I shall send you a scanned copy of my international passport for your perusal and records. I beleive that upon receipt of this document, you shall avail us the necessary information we require to commence this laudable transaction. While I expect to be in touch with you tomorrow, my warm regards to you and your family. I hope this correspondence meets you in good health. Sequel to my last email correspondence to you, find attached to this mail is a scanned copy of my international passport for your perusal and records. I beleive that with this, I have satisfied all your obligations and we can now move forward towards bringing this laudable transaction to fruition. We need this information to enable us include them in the file of late Engr. Steve Moore(Snr) that is in our pocession. As soon as we receive this information I shall let you know the procedure on how we intend bringing this laudable transaction to fruition. While I await your prompt response and also wishing you a nice day, my warm regards to you and your family. 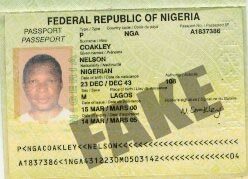 The passport image is too small to verify its authenticity. Please scan the passport at a higher resolution. 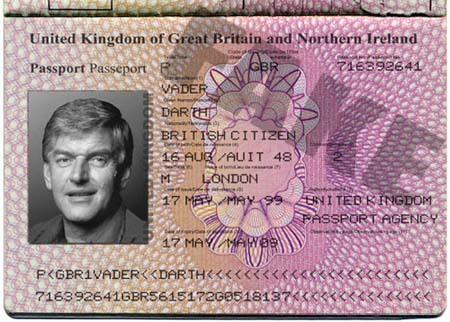 copy of my international passport. Please confirm if you can read this copy . While I wait to hear from you my warm regards to you and your family. I hope this correspondence meets you in good health.Sorry I have not been able to respond to you since, my computer had problems. From your mail I beleive I have satisfied all your obligations and we can now move forward towards bringing this laudable transaction to fruition. Please find below my particulars. As I think I have mentioned before, I am a busy man, so if I am not at home to speak with you please leave me a message and I will call you back. The password phrase you need to use for the next week is, "EYE YAM A PEEDO FILE". Please repeat the password SLOWLY three times slowly for clarity. Nelson Coakley Voicemail. Received 23/11/03. Click HERE to listen (106k/66 seconds).